Today we saw a fresh new batch of War of the Spark preview cards, and one card, in particular, caught my eye. 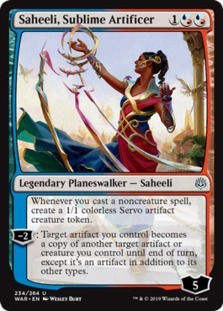 Saheeli, Sublime Artificer is one of the many uncommon planeswalkers available in the set, and her passive is one of the most interesting ones. Creating a servo every time you cast a spell is a great value, and the fact that it is an artifact enables many synergies that weren’t possible before. When building around Saheeli, one thing you need to decide on is how to play with her. Many people are considering using Saheeli as a replacement for Murmuring Mystic in Standard drake decks. This is good, and she will probably have a great home there, but I am more interested in abusing the many servo tokens she creates. There are several cards in Standard that get better the more artifacts there are such as Karn, Scion of Urza, but the card I am most interested in is Storm the Vault aka Tolarian Academy. Tolarian Academy is a card that is only legal in one format: vintage, and even there it is restricted. This card was behind some of the most busted decks in the history of Magic, and while Storm the Vault is nowhere near Tolarian Academy, that kind of history is telling. Flipping Storm the Vault isn’t that hard either, as it plays into our gameplan of wanting as many artifacts on the board as possible. With 5 or more mana available after it flips, what can we do with that? In a deck like this, based around artifacts and planeswalkers, one of the best ways to use all of our mana is with Mishra’s Self-Replicator. With almost every card in the deck being historic, we can easily make an army of Replicators that will, in turn, make our Tolarian Academy tap for even more mana, which means even more Replicators! It’s easy to run out of cards in hand when you have this much mana, however, thanks to Jhoira, Weatherlight Captain we can keep the gas flowing until we have created our army. One thing that really impresses me about this deck is the amount of redundancy the deck has. When the deck doesn’t have Storm the Vaults we have Powerstone Shard. When we don’t have Jhoira for draw we have Treasure Map. If we can’t make an army of Replicators, we can still make an army of Servos. This redundancy allows the deck to execute its gameplan even in the face of opposition. And with even more to be spoiled in the set, who knows what other tools this deck might receive. Thank you all for reading, I hope you have a great week and an amazing Tuesday!